Do you dread tax season? Probably. Or, if you’re an accountant, of course, you do. The paperwork. The approvals. The document creation. It can be a nightmare, but it doesn’t have to be. In this article, we’ll give you some advice on how to not only survive but thrive during this year’s tax season. First, let everyone know what to expect. Most people are incredibly understanding when you explain what you’re going through. Let people know you’ll be busy. Let them know when you think your schedule will open up again. Tell your people what you need from them. Do you need quiet time to focus? Do you need them to be ok with you spending more hours at the office? Whatever it is you need to survive tax season, set that expectation early so people do not think you’re giving them the cold shoulder. In other words, help them help you. Tax season is stressful enough by itself. But it’s even more stressful when you have a lot of clients who all need their taxes done at the same time. It can be a mad rush to meet all of your deadlines and get everything done in a timely fashion. This is the hardest time of the year to be an accountant. eFileCabinet wanted to make things a bit easier for you this year. Here are some tips to help make this tax season a bit easier to navigate. Wake up early. Have a good, hearty breakfast, Do some exercise. And read the newspaper. 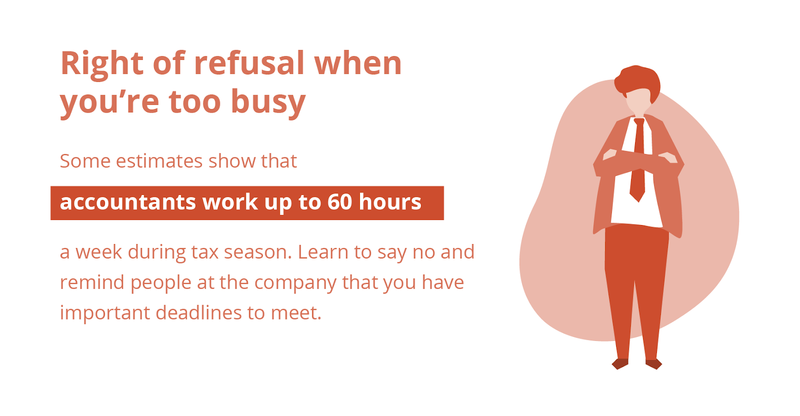 When you’re working extra hours during tax season, it’s tempting to sleep in, grab a coffee, and eat fast food. But none of this will make you feel any better. In fact, bad habits are likely going to slow you down and keep you from doing your job effectively. 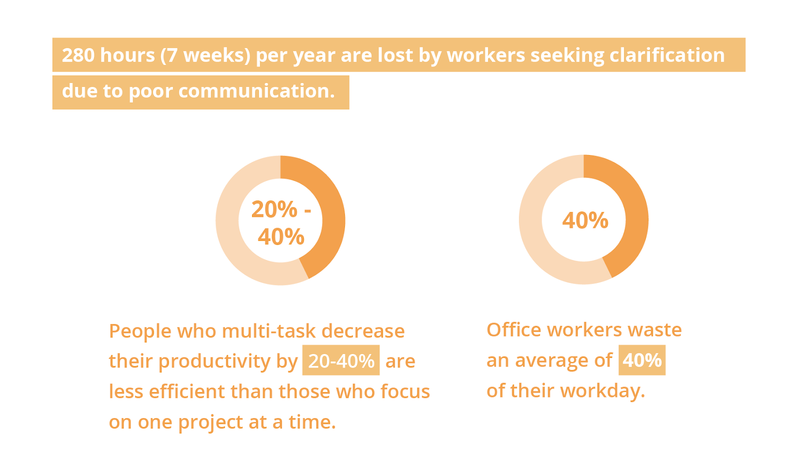 The less effective you are at your job, the longer you’ll have to work to do it. The longer you have to work to finish your job, the harder things will get. Find a strategy that works for you, but make sure it wakes up your mind and body, so you can get work done quickly. Sometimes, setting time aside in blocks so that you don’t have too many things stacking up can be helpful and not so overwhelming. Pro-Tip: avoid multitasking. People who claim to ‘multitask’ decrease their productivity by up to 40%. That’s not the solution if you’re wanting to get these things done as quickly and efficiently as possible. 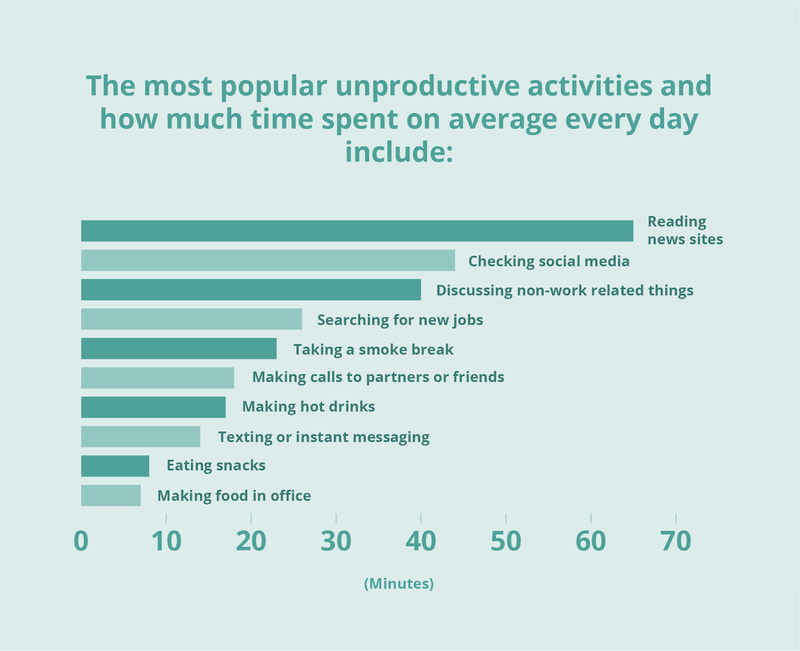 Also, keep in mind the activities that are distractions or time wasters. When handling tax documents, there are plenty of tasks you need to complete, but many of those tasks shouldn’t require your attention. An example of this is the need to create the same tax forms for different clients or business entities. When handling tax documents, there are plenty of tasks you need to complete, but many of those tasks shouldn’t require your attention. An example of this is the need to create the same tax forms for different clients or business entities. There is so much you need to get done, whether it’s document creation, access, and permissions, or approval workflows. But all of these things take time. Time you don’t always have. You need a good document management system that can automate these tasks so you can do more meaningful work. The easiest way to do your more pressing work is to automate those repetitive tasks so you don’t have to think about them again. 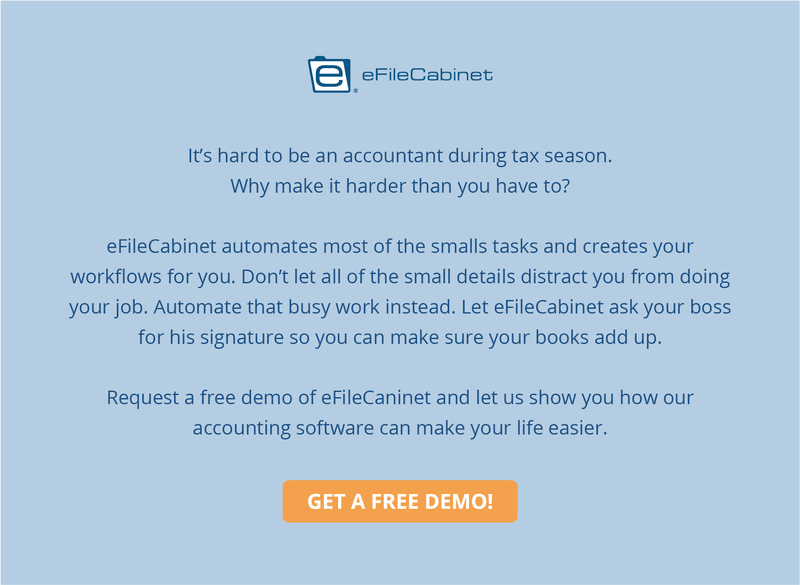 eFileCabinet can be set up to auto-populate the same set of documents for each client, so you don’t have to. Our Zonal OCR can be configured to read scanned documents and fill out electronic forms for you. Our folders can create document permissions automatically and send those documents to the appropriate people in your workflow. eFileCabinet is the best document management software for accountants that removes your busy work. Every Economics 101 class spends a day talking about diminishing returns. The concept is simple. You can spend a certain amount of time, effort, or money on a good or service. Each time you do, you get a certain amount of benefit. But the amount of benefits you receive lessen with each additional investment. It’s why a bowl of ice cream is delicious but a gallon of ice cream will make you sick. 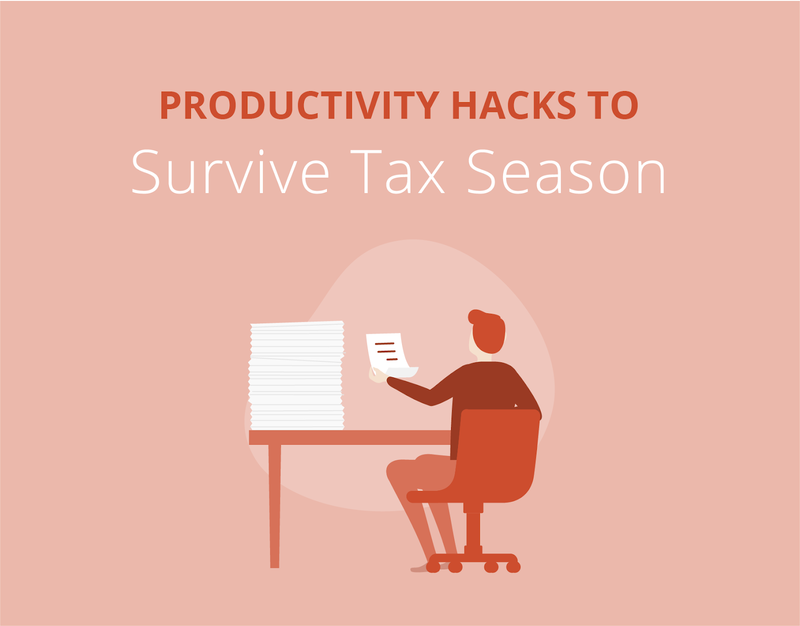 Sure, this tax season you’ll have to work longer hours than you normally do, but that doesn’t mean you should be working around the clock. There comes a point every day where you’ll burn out. At some point, another hour of work isn’t going to get you any closer to meeting your deadlines. Try to recognize where that line is for you and stop before you get there. Go take a walk or enjoy time with your family. Do something to recharge so you can focus on doing your job again. Take breaks when you need them. It results in increased productivity and ultimately yields positive outcomes than if you rush lunches or drag your workday on. Next, turn off unnecessary notifications. Need we say more? Set timers to remind you and your client that taxes are an urgent matter that should be prioritized. Upgrade your software. Going digital can make it so you aren’t scrambling to find documents because they’ll all be on your server. eFileCabinet can make your life so much easier. 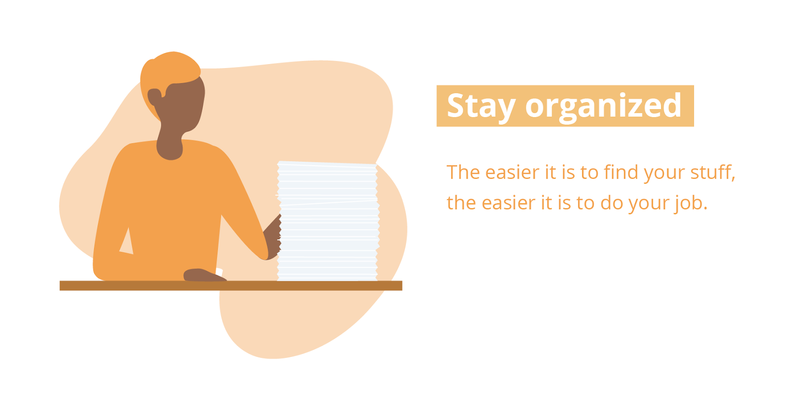 It’s more than a fancy folder system that you can use to store your documents. It can create documents, workflows, and digitize physical papers with little help. You’ll need to set up the initial system, but once that is done eFileCabinet will do the rest automatically every single time. And if you’re afraid that you can’t afford that initial investment of time, don’t worry. We offer white glove services and will help you set up your system so that it works for you and your company.